There is nothing better than a good story. There are many ways to tell a story. There is also more than one side to a story. In The Rhyme of King Harold, by Ian Macgill, published by Grapevine Publishing 2014, the author takes a creative approach to the tale of King Harold. Although the book is labeled a novel, Macgill tells the story in the traditional medium of poetry. Saxons revered their bards, because they preserved and passed on the tales of heroic deeds. King Harold’s people would have been familiar with the format, and it is an apropos way to approach this subject. Macgill also takes a different perspective on the King Harold story. Through the rhymes, the reader learns more about Harold as a person. He becomes a more sympathetic character than the one depicted on the Bayeux Tapestry or so often maligned by history as an usurper. One more than one occasion, I found myself pausing to reflect, I hadn’t thought of it like that before. 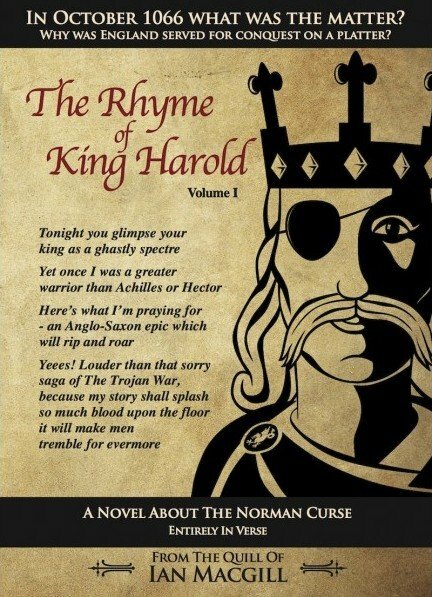 Occasionally the rhyme overshadows King Harold’s story. Macgill jumps around somewhat from subject to subject and events are not always revealed in chronological order. Another drawback is a formatting issue of Kindle. The novel can only be read on a Kindle device, not through a Kindle app, and the print is very small. To be fair, formatting for Kindle is a difficult process. I would recommend the eBook version in iBook instead. Although the epic poem is not typical reading for many in our time, it is a fresh if not recycled approach to the idea of how we spin a tale. The Rhyme of King Harold is an entertaining way to learn more about the flip side of the Bayeux Tapestry and getting in touch with your Saxon roots.